When a group of nautical types get together they invariably indulge in a session of 'swinging the lamp' - recounting favourite tales of the sea. 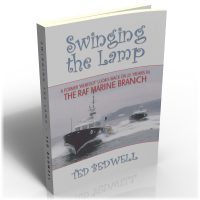 As the title of his book suggests, Ted Bedwell is a great storyteller in this nautical tradition. In the course of over 270 mini-chapters he looks back on a wide variety of incidents – from the hair-raising to the downright hilarious – which occurred in the line of duty during his 22 years in the Royal Air Force Marine Branch. Disbanded in 1986, this lesser-known branch of the RAF was equipped with a wide variety of ships, from small launches and tenders to large sea-going support vessels. Dubbed 'webfeet' by the Royal Navy, Marine Branch personnel carried out a wide variety of duties over the years: servicing the needs of flying boats, target towing and torpedo recovery on offshore gunnery ranges, air-sea-rescue, offshore policing duties etc, etc. In the course of his career, Ted, a former coxwain, served on most types of craft used by the Branch and was involved in most kinds of work that the Branch was called upon to carry out. His marvellous tales of waterborne mishaps, misdeeds and mischief are guaranteed to amuse and entertain all readers but will, of course, be of particular interest to fellow RAF Marine Branch veterans, for as well as being a thoroughly enjoyable personal memoir it is also an excellent record of the work carried out by the Branch during the post-war era - in locations as far apart as RAF Mount Batten (Plymouth), Portrush (Northern Ireland), Gibraltar and RAF Gan (Maldives).